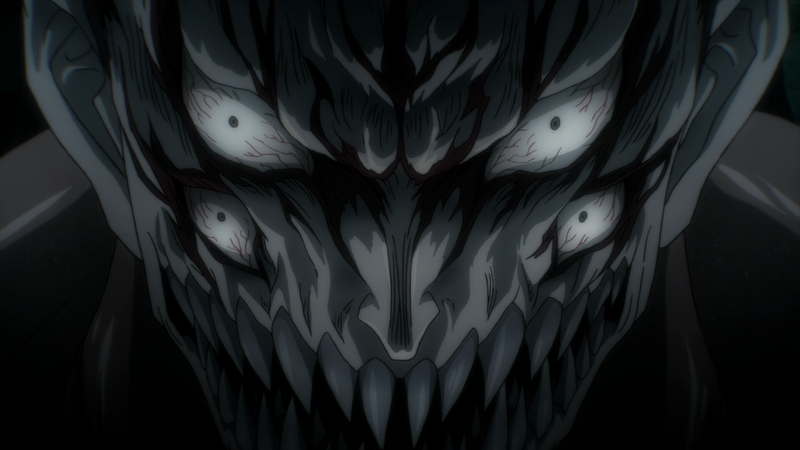 When the anime adaptation Parasyte -the maxim- first debuted in Japan many were curious about how well it would do considering the original manga had wrapped up two decades prior. Now we know that not only has it become a rather popular success in Japan but has also flourished in the West. 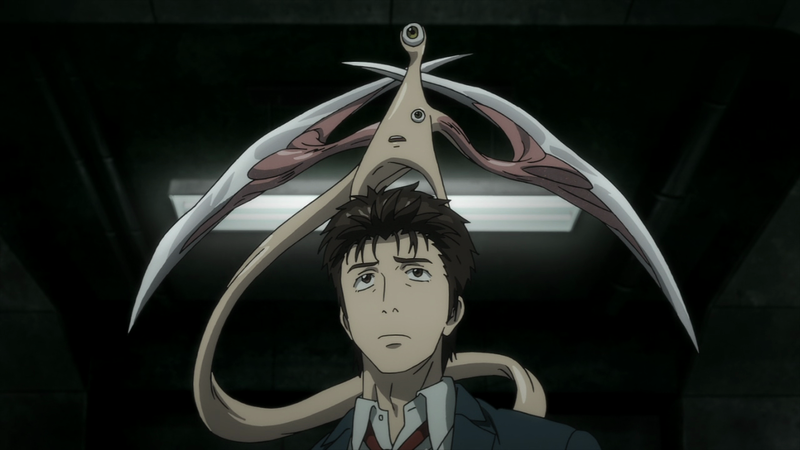 After making a full run on television Sentai Filmworks has released the second collection for Parasyte -the maxim-. Now does the series come to a satisfying conclusion? It is worth noting that those who have yet to watch the first twelve episodes of Parasyte -the maxim- should do so before reading further as this review will discuss various events that take place after major moments in the first half of the series and may spoil certain twists as a result. The thirteenth episode picks up shortly after the death of Kana and how her death is affecting, or shall we say not affecting, Shinichi in any normal manner as he continues to struggle with losing elements of his human nature. 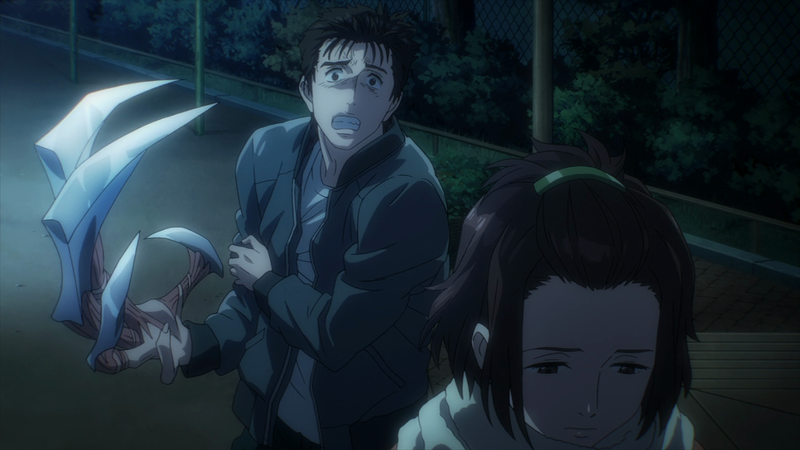 This changes quickly however as Shinichi learns that someone has begun investigating him at the behest of Reiko and rather than simply try and continue hide the fact that he is indeed infected with the parasite Migi, he begins to work with the investigator to try and uncover more about the activities of the rest of the parasites in the city. Despite Shinichi’s best efforts, things turn sour and it is here that we see a refreshing and noticeable shift in the story for Parasyte -the maxim-. After slaying another parasite that is part of a large collaboration, Shinichi chooses to temporarily flee the immediate area in an effort to avoid bringing danger upon his father, friends, and his classmates. This shift in focus allows us to not only get a glimpse at Shinichi and Migi’s developing relationship as the two continue to bond over the course of their struggle to survive but also allow other characters to step into the spotlight. Previously the actions of the other parasites in the area were kept largely unknown but this second half of the season provides quite a bit of insight into Reiko Tamura. While Reiko may have been a character that was initially portrayed as a cunning enemy, this intelligence begins to evolve throughout these episodes as we see Reiko slowly begin to feel things that no parasite has seemingly ever felt before. Watching Reiko bond, in her own rather cold looking way, with her child and then eventually make the ultimate sacrifice in an effort to keep the child safe makes for one of the most striking moments in the series thanks to well-handled writing and the immediate impact upon the rest of the story. Not only does this show that these parasites that were once portrayed as cold calculating killing machines can develop feelings and even some semblance of love, but the fact that this act is witnessed by Shinichi begins to thaw his previously frozen emotions, allowing him to once again feel more like a human being and able to bond with those close to him, putting him at a stark contrast once again with Migi who continues to believe that survival is key above everything else and cannot understand Reiko’s actions. As the series moves towards its final arc humanity has begun to move forward with a plan to root out an infestation of parasites that was revealed through Reiko’s last words. While proven to be extremely effective for the most part, the actions taken by the police during this section begin to mirror just how callous humanity can be when it is their lives being threatened, going so far as to even kill other humans as long as it means they can stay safe. This nature borders that of the parasite’s desire to survive and their cold calculating methods and this point is driven even harder once Shinichi and Migi are forced to face off against nearly impossible odds in order to survive. 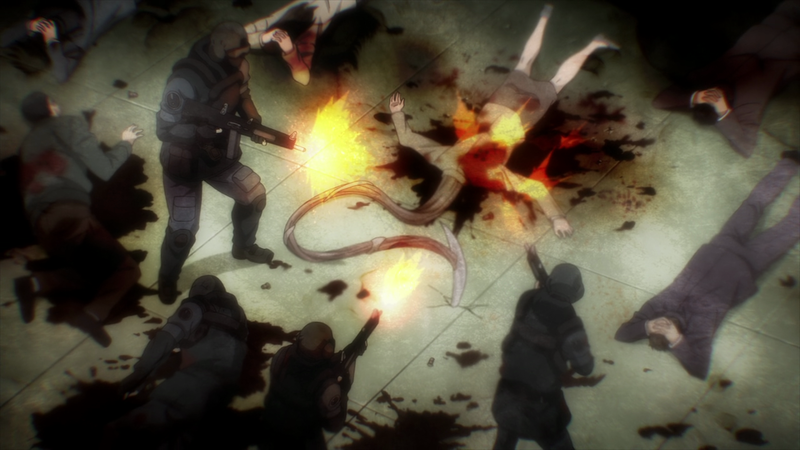 The last half of Parasyte -the maxim- doesn’t really offer anything too surprising or any major twists that weren’t already previously mentioned outside of the fact that some parasites may be stronger than others. That being said, the amount of moral questions raised and the interactions between Shinichi and Migi and the restoration of Shinichi’s humanity remain one of the biggest parts of the series and even though his interactions with side characters does diminish some, a few notable moments really help make this half shine. One of the biggest improvements that one will notice while watching through the last twelve episodes in Parasyte -the maxim- is that the action sequences have been varied up a bit. Thanks to most of the creatures that are still alive being able to survive longer, they use various techniques that differ from the standard flailing bladed tentacles that made up the first half of the season and even transform in some rather unique ways. The gruesome nature of the series does simmer down a little bit as well as very few feedings are openly presented like they were originally so this means that while there is still plenty of blood, don’t expect to see too much real horror this time around. Similar to the first half of the series Sentai Filmworks has released collection two with both an English voice track as well as the original Japanese dub. This half of the season features a few less characters than before thanks to the focus shifting away from most school activities but the English cast still handles their roles rather well with Brittney Karbowski’s portrayal of Migi still serving as a great choice and Vicki Barosh’s handling of the temporary character Mitsuyo fitting nicely considering the character’s role. The soundtrack for the series is fairly standard this time around as most of the background music takes on a bit of a simpler vibe during battle sequences though the tracks chosen still work rather well. It is worth noting that the opening and ending themes for this half of the series remain unchanged and while the opening still works well, the ending theme isn’t used nearly as effectively as it was during the first twelve episodes. The bonus features for Parasyte -the maxim- Collection 2 are fairly simplistic as they only include a clean version of the opening and ending theme, though these are only slightly altered from those found in the first collection, and trailers for other Sentai Filmworks releases. 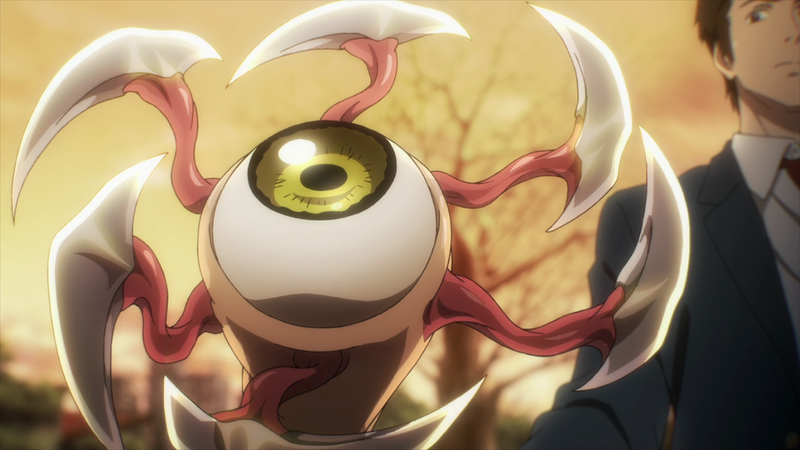 Parasyte -the maxim- Collection 2 brings the series to a satisfying close. While a few loose threads are left hanging to leave viewers wondering about the future of the world, nearly everything is wrapped up nicely by the time the series comes to an end. A number of notable themes are brought up numerous times throughout this second half and explores them quite well and even the action sequences are ramped up a bit this time so many fans of the series should be rather pleased with the way this Parasyte -the maxim- comes to an end. 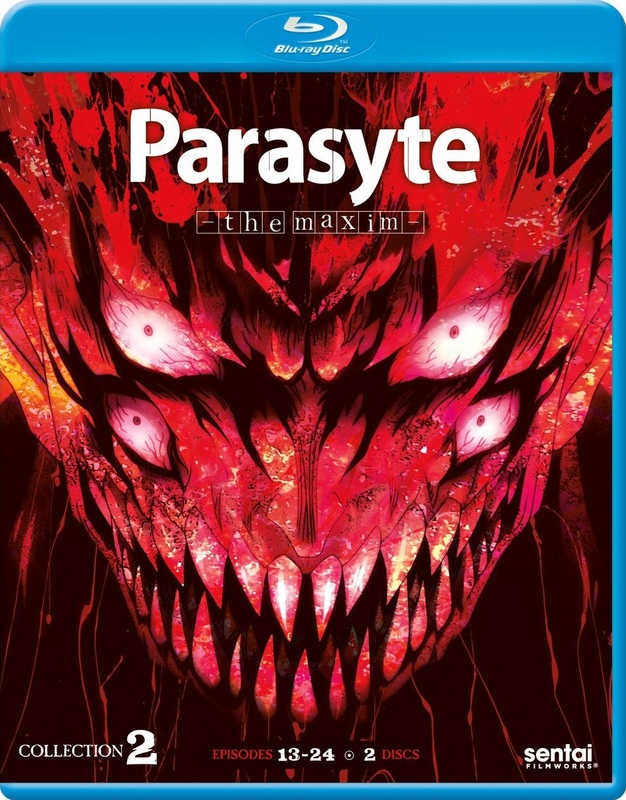 Parasyte -the maxim- Collection 2 ramps up the action and brings with it a number of interesting topics that help the series’ shift in focus from losing anyone who may have enjoyed how things were progressing in the first half of the series.